Does Python have anonymous classes? The specific requirement is being able to create an object with specified fields in expression context (e.g. usable in lambdas and other places where statements aren't allowed), with no additional external declarations, and ability to access individual components by name via the normal member access syntax foo.bar. The created object should also implement structural comparison by component names (not by position, as tuples do). In particular: tuples isn't it because their components are not named; classes isn't it because they require a declaration; dicts isn't it because they have undesired foo["bar"] syntax to access components. I know how to write such a thing in Python if needed. But I would like to know if there's anything like that in the Python standard library, or any popular third-party libraries. Technically, it satisfies all the requirements of the question, but I sincerely hope that no-one ever uses it (I definitely won't). Meets all your requirements except that you still have to do foo['x'] instead of foo.x. where the 3rd parameter is the dict that will contain the fields of your object. 2) Another variation is proposed by Peter Norvig at http://norvig.com/python-iaq.html. It is also similar to the answer posted by Ken. The benefit of this method is that you can implement equality by contents of the dict, which the first option doesn't have. 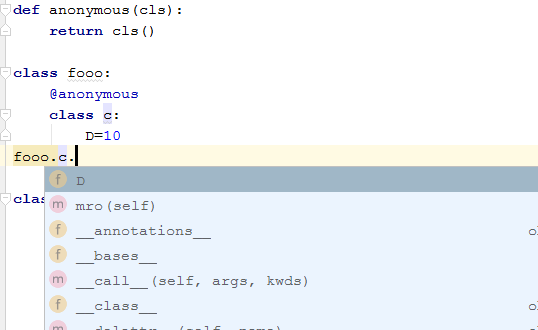 Looks like Python 3.3 has added exactly this thing in the form of types.SimpleNamespace class. The type(...) form will fail the structural comparison requirement (without getting really ugly). The dict(...) form doesn't meet the attribute accessor requirement. But it means defining a special class. If you want the instance to be anonymous as well (using the object directly in an expression), then you're bound to use the type-expression. However in many cases the instance will not be anonymous, but assigned to a variable. This case can be handled in a reasonable way in python by using metaclasses or decorators. Another feature in python that accomodates for many use cases is that it's legal to define classes locally, which means that they would become a symbol local to that function, which in turns gives it some degree of anonymity. In Jython, can I make an inline anonymous class that implements a Java interface?